What types of insurance do I need to trade internationally? When you start to trade internationally you will realise that everyone talks about insurance in different terms. This article gives you a general overview of how each type of insurance is described, what it does and where it might impact on your international business. In some markets (particularly the USA and Canada) Product Liability and Professional Indemnity premiums can be very high due to the increased likelihood of litigation and higher claims pay outs. These markets attract such a huge amount of legal activity which could potentially cause premiums to dramatically increase if you export to these markets. This is because insurers determine the level of risk they are exposing themselves to. When travelling in the USA you will see attempts to mitigate against legal action – for example, the ‘caution hot’ warnings used on coffee cups or a note on a hammer that it is ‘not to be used on human flesh’. These examples are product liability taken to an extreme! Incorrect or improperly arranged insurance could leave you exposed to huge losses if a claim occurs that could not only end your exporting, but also your business. Similarly, you need to ensure that there are no gaps in your exposure, for example failure to take proper care when arranging Marine insurance could result in a shipment being unintentionally uninsured. The Insurance Act 2015 requires of you to make “a fair presentation” of the risk – put simply, this means that you have to make a full and frank disclosure of your business activities to insurers, and do so after making a reasonable search of your records. If you are exporting, a fair presentation will involve advising the insurer what you are exporting, where you are exporting to, and how much you are exporting. It is vital that the correct questions are asked, and that the correct information is provided to insurers. An experienced insurance broker should be able to help you with this and make sure your duty is correctly discharged. Deliberate or Reckless The insurer can void your Policy or retain your premium. The claims will not be paid. c. If the premium should have been higher, can reduce claim payment in proportion to the premium adjustment. Are you compliant with different Regulatory and Tax regimes? Do you have different options for transiting goods (road/air/sea) and what are the risks involved? Will you transport yourself or use third parties? Do you have sufficient testing and quality control procedures in place? Is this evidenced or documented? Do you know what your product will be used for after export? Will it be incorporated in another product? Can you control its use by contract or other means? Do you have recall procedures in place? Do you have a Business Continuity Plan in case of crisis? Do you have any access to crisis resilience advice or assistance? There are several core insurance policies that you are likely to need if you are planning to export either products or services. You may already have these policies in your existing programme but it is not sufficient to simply have a policy with these names/descriptions on it – you still need to advise the insurer of your export activities as the policy wording may not be suitable, and in order to discharge your duty of disclosure (as explained above). This cover protects you in the event that your product causes injury or damage to a person or their property. You could be liable to pay compensation in these circumstances even if you didn’t manufacture the product, and the costs can be severe. If you design, manufacture or supply a physical product, then you should have this cover, even if it is manufactured by someone else. Some countries will apply a strict liability to injuries caused by faulty products so you can be liable even if you haven’t been negligent and it isn’t your fault. If you do not manufacture but distribute, do you carry out sufficient quality control testing? Do you have any rights against the manufacturer? Have you provided adequate safety instructions and warnings about misuse? Have you included terms for return of faulty goods? Do you have adequate record keeping and traceability? Most insurers will provide Products Liability as part of a standard Combined Liability policy. An experienced Insurance Broker will be able to advise on constructing appropriate cover and on what limit to select. This covers the cost of compensating clients for loss or damage resulting from negligent services or advice provided by a business or an individual. If you offer your knowledge, skills, design or advice as part of your profession or business, you should have this cover. Common claims include negligence, misrepresentation, violation of good faith, inaccurate advice, and flawed design. Professional Indemnity is usually written on a ‘Claims Made’ basis. This means it is the insurer at the time the claim is made that pays, not the insurer at the time the actual incident occurred. Most policies will have a ‘retroactive date’ which is the date from which incidents occurring are covered. It is important that all circumstances that might lead to a claim are notified to the insurer otherwise cover may not apply. If you are changing insurer, the new insurer will usually provide cover for claims relating to prior incidents as long as you had insurance in place and any circumstances you are aware of (or should have been aware of) have been notified to the previous insurer. Do you have an adequate limit of indemnity? Again, the experienced insurance broker is your friend and they should be able to arrange a suitable policy on your behalf and advise you on appropriate limits and cover. If you are a member of a professional body there may be a scheme in place which offers appropriate cover at preferential rates. 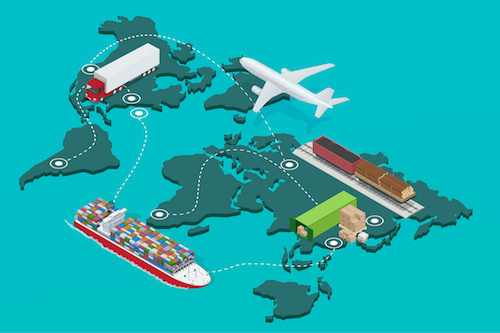 If you are exporting a physical product then it needs to move from your factory or warehouse to your customer, and Marine insurance provides cover for this. There are a number of means of covering goods in transit and often this depends on who is made responsible for the goods whilst they are in transit. If you are responsible for the risk of loss or damage while transporting the goods to your customer, then cover will normally be arranged by you. Alternatively, your transport of the goods may be carried out by a specialist third party haulier. In this case, the haulier may provide cover – but you should check this carefully. The haulier may charge a higher cost than if you insured yourself, and cover may be limited. In some cases, the customer will prefer to arrange the transit themselves and if this is the case then they will usually insure. Again, it is important to check what cover is in place. You can either insure single transits, or put an annual policy in place to cover all transits. If your products are of significant value, or you are shipping large volumes, then you would usually seek to protect your interests by insuring the risk. Alternatively, you could seek to make your customer responsible for the transit risk via contract (though bear in mind that most customers will prefer that you take the risk for obvious reasons). You may have your own fleet of vehicles to transit goods, or you may use a third party carrier or the customer may arrange for their own vehicles to collect. There are many different options and it is worth discussing your needs with an insurance professional who can help you establish where the risk lies and what the appropriate insurance should be. A large number of documents are often needed to support a claim – the policy / certificate, invoices, packing lists, bill of lading, survey report or evidence of loss, landing account, correspondence etc. It is important that you keep sufficient records. If you are shipping a single high value item, in some cases insurers may wish to arrange for a surveyor to travel with the item or meet it on arrival to make sure it is undamaged. You need to select appropriate sums insured / limits and declare accurate figures based on these limits. Depending on your contractual requirements and your role in the process (seller or customer), you may wish to insure on sale value or cost value, or cost + insurance + freight. Cover can also be provided by Hauliers on a cost per tonne or total value basis. Insurers may impose a single transit limit or a total limit and may ask for an estimate of annual shipping, split per location. They may also ask for declared actual figures at the end of the policy and adjust the premium accordingly. Contingency / Seller’s interest Insurance – If the buyer is responsible for arranging insurance and you are not comfortable with the cover they have arranged, you can purchase additional contingency cover which would pay if the buyer’s insurance fails to respond. Usually this has to be kept confidential and not advised to the buyer. The experienced insurance broker will be able to advise on the correct cover to suit your needs and obtain an appropriate policy for you to meet those needs. In the UK, Employer’s Liability Insurance is a legal requirement for almost all businesses that have employees. It covers your legal liability to employees for injury, illness or death sustained whilst carrying out your business. Although you may not have employees permanently based overseas, exporting can lead to your UK employees having to travel overseas for work. For example, travelling to a customer site to install or assist with installing a product or service contracts where your employees visit your customer to service a product in situ. It is important that you advise your insurance provider if your staff will have to travel overseas, particularly if they are travelling to North America, countries where the FCO advise against travel, or offshore. This covers you for legal liability for injury, illness or death suffered by third parties arising out of your business. All the comments above in relation to Employer’s Liability apply equally to Public Liability. In addition, it is particularly important that your insurance provider has full details of where your staff will be and what kind of work they will be doing. An employee carrying out welding work in a large factory overseas will have a much higher risk than someone providing IT consultancy in an office, for example. In addition, work in some countries will have a greater risk in terms of the likelihood of litigation if something goes wrong. Your insurer must be made aware of what you are doing and where, otherwise the cover may not be in place, even if you have a policy. The territorial limits and jurisdiction limits must be correct – but don’t worry, this is something your broker should be aware of and should be able to help you with. It is important that care is taken when entering into contracts for export, and that you have taken legal advice and, if necessary, advice from your insurance provider. There are a number of pitfalls which can be avoided with a little care and attention but which can result in huge uninsured losses if not dealt with. Many purchasers (again, particularly in North America) will attempt to place all liability on your shoulders – you may see terms like ‘hold harmless’. The difficulty with this is that insurance will generally not cover you for any liability you have assumed under contract. It may be easier to consider an example. Exporter A from the UK exports Widgets to Wholesaler B in the USA. Wholesaler B has a ‘hold harmless’ in their contract with Exporter A. Wholesaler B stores the widgets in a warehouse without heating which damages them, and when End User C buys a widget from Wholesaler B, it explodes and causes damage to End User C’s factory. End User C sues Wholesaler B, who passes on the cost to Exporter A via the contract. In this example, Exporter A’s insurers would not provide cover as Exporter A had not been negligent and therefore in the absence of the contract, would not have been liable. Exporter A is left with a massive legal bill and no insurance to pay for it. So it is imperative that contracts are properly reviewed and checked. These can be expensive covers that few organisations purchase, but they are available should you wish to fully protect your interests at the expense of a significant premium. Product Guarantee provides cover against the cost of replacing, reworking or recovering products that have failed to perform their intended function due to faulty design, manufacture or installation after handover to the customer. The liability covered is contractual in origin. Cover is normally Claims Made (see above, Professional Indemnity). Product Recall covers reasonable and necessary costs of recalling a product where continued use or consumption may cause the manufacturer to incur a legal liability. Be aware of the risks you are exposing your company to. These risks if faced in the UK are a nuisance but, internationally, they will drain your business of time and money for legal costs both here and in the market where you have sold.